Materials - oak, bronze, chrome. Skyward celebrates the aerial nature of the aviation and the aerospace manufacturing history of the site. The title Skyward implies a sense of optimism and looking forward. 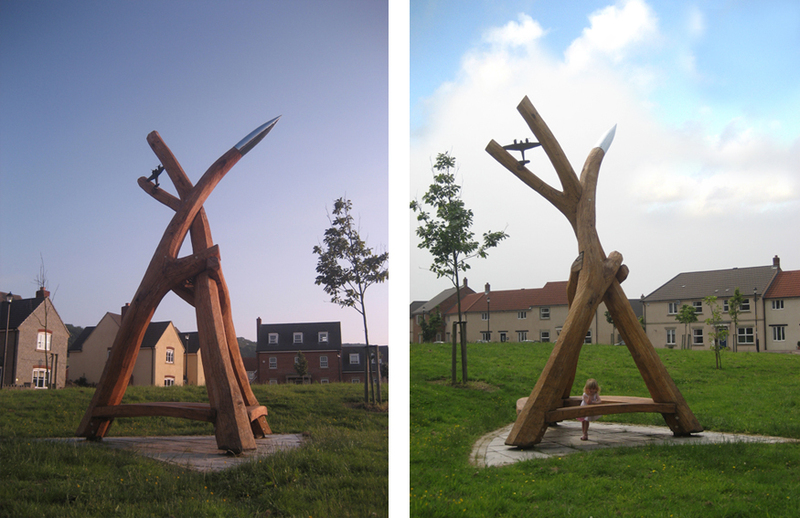 The sculpture is composed of three lengths of branched English oak, jointed to form a tripod structure, with a bronze rocket and a Bristol war plane. The form could also be interpreted as a kind of teepee, representing the idea of home. This is an oblique reference to the post-war production of prefabricated houses at the former factory, and recognises the new development and its community. A decorative grille depicting a sun face is fixed within the aperture formed between the jointed timber branches. Sunlight through the grille casts a shadow on the paved surround, its shadow relating to the title of the former Banwell Shadow Factory.